REI is working with OCTA to promote bike commuting in the local area. With safety the number one concern about commuting in the county, education is a large part of the efforts being made to make our roads safer for those working so hard to reduce the environmental, and economic strains. Hey, Steve from REI-HB here, I'm having a free class on commuting at the store on 5-15 Thursday night at 7 pm. Please come. 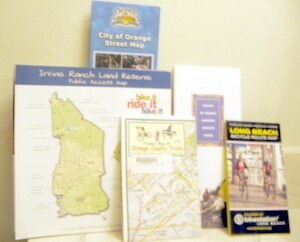 I would like to have you say a few words about OC biking and your web site. This is the first class on commuting, I think there will be a lot of folks. I didn't know until Monday if I could switch one of my days off, but the switch was made, and to REI I went for the 7pm event. I arrived at 645pm, and Steve took me into a back storage area whre he had set up 20 chairs, a couple of tables, and a screen for a slideshow presentation. He optimistically expected 20 people, and I had enough copies of my promotional flier for the Dude to handle twice that number. Attendees began to arrive, including one man who was already aware of this blog, thanks to Steve, and we chatted a few minutes. Attendees included older men, and younger men, a young lady, and even a father with his young children. As you can tell...it was standing room only! Steve gave out my flyer to the attendees, briefly introduced me, and began his presentation. 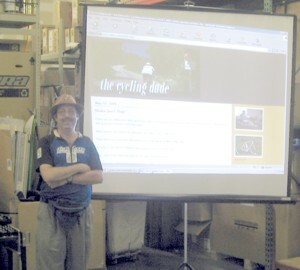 His slideshow touched on the benefits of bicycle commuting, how to select the proper bike, and tires, and preparing your bike for riding. He showed us different tires, examples of headlights, and rearlight, and talked about the benefits of each. 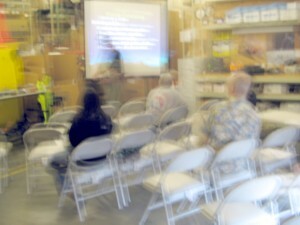 Then the other guest arrived early, was introduced, and began his talk, and question and answer period. 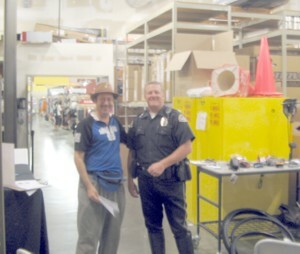 Officer Stover, of the Huntington Beach Police, was filling in for the Officer who had planned to attend, but was unable to do so, and he did a splendid job. While he brought up several subjects important not just to commuting, but cycling in general, the questions asked by his listeners, including myself, brought out more information, and insight, from him, than might otherwise occured, I think, and his combination of serious, and humorous, handling of this added immensely to the success of the evening. 1. Many motorists are not paying attention to you, the cyclist on their right, near the curbs. I mean, um, well, between maneuvering their car, SUV, or 18-wheeler down the road, shaving, eating breakfast, yelling at the kids/spouse/ or others in the vehicle, and/or talking on the Cell Phone, or text messaging, they can't be expected to be fully aware of their surrounding now can they? He made the point that because of the dangerous behavior of some motorists it was important that any cyclist on the road be a defensive driver, and take charge of his/her ride. Knowing how to ride safely in the streets makes the journey safer for you, and those around you. He expressed pleasure that texting and certain ways of using a cell while driving, will soon be big no-nos in state law..
2. He made the point that cyclists riding at night need to make themselves seen, through proper lights, and even reflective clothing, and that it is illegal for cyclist to ride with earphones in their ears, for radios, and ipods, and that using a cell phone while cycling was illegal , too. 3. There was a great discussion of Bike Lanes, with me bringing up the different variety we cyclists have to deal with, especially those placed on the left of where cars are allowed to park on streets. As I mentioned how I hated those particular types, and why, the discussion centered on safe riding in the street, and how taking the lane, using hand signals, and the type of clothing worn, not to mention proper lights at night, can often help a cyclist make his/her presense known to the motorists around them. 4. He agreed, and disagreed, with me on the safety of cycling on the sidewalk. While just about everywhere cycling on the sidewalk is illegal, he said thre are times where it might be advisable such as with young children, and under conditions where it might actually be neccessary to continue for a time, and I agreed. 5. 90% of stolen bicycles will never be recovered because owners never write down the serial # of their bicycle. 6. Many officers, including himself, consider INTENT over the LETTER OF THE LAW, and try to be fair, when dealing with cyclists. A. Cyclists going in the wrong direction. B. Bike on Bike: As hard as it may be to believe...some group cyclists ride too close to each other, resulting in collisions. C. Incidents with motorists at driveway entrances and exits. Busy Pacific Coast Highway is a popular route for club/group rides, even during busy traffic periods, whic are frequent. 8. While he agreed that more and more cities have Cops on Bikes, and more departments are making sure officers on patrol are aware of Bicyclists, and issues surrounding our presense on the street, such activity varies based on the needs of the communtiy. As certain new shopping/tourist venues are developed in the the city in the future, more Bicycle Patrols may appear. The city currently focuses most of its efforts toward education of minors. Finally it was time for Officer Stover to go, and Steve asked me to take the stage. Not knowing how long I was expected to speak I came with some basic themes in mind, and hope that, in my own, inexperienced, way I was able to get them across. After introducing myself, and making sure everyone had a copy of my flier, explaining about The Cycling Dude, and what it had to offer. I talked about my life long use of my bike, including in tandem with mass transit, and how Bike Trails such as the Santa Ana River Trail, the San Juan River Trail, the Aliso Creek Trail, the Beach Trail, and the Mountains to the Seas Trail in the OC (I'm tossing the the San Gabriel River trail, Rio Hondo Trail, and Los Angeles River Trail in Los Angeles County, the Santa Ana River Trail in Riverside and San Bernardino County, trails in San Diego County and new trails in San Bernardino County into the mix as I write this report after the event.) all offer fine, daytime, routes, for part of, or all of, the commute of a cyclist. I mentioned that I knew of a local cyclist that uses one of those contrations (Charriots/Trailers they are often called) for pulling your kids behind your bike on a ride for carrying up to $80 worth of groceries on a shopping trip! I talked about how there are maps, and websites online that can help people find places to ride, and that some cities, such as Long Beach do more than offer the standard street map, but specifically aimed at cyclists in their community. I discussed the various types of resources that can be found on my blog, and online in general. As I talked, I was nervous, yet focused on what I was hoping to share. I knew this wasn't a reflection on me, but of the interest of the attendee, and the need to be somewhere else, and I just hoped they took my flier home with them, and make use of it in their lives, and the lives of their friends. With one person left I brought my presentation to an end. The man asked a few questions, and that was that. Steve assured me I did fine and, for the first time in the spotlight, maybe I did, but the experience shows me that preparing for a presentation, and standing up in front of an audience, no matter the size, to give it, are not as easy as it seems. Watch Mat Barlow, of Bikes Belong, in a cool video on the benefits of Bike Commuting: Bicycling for Short Trips: Good for You and the Environment. A Tip of the Hat to brand new BikeBlogger Cycle Pig for the heads-up on the video! It is great that you are out there promoting the cause and thanks for the reference to Cyclepig. Speaking in public is never easy and I think even the best still get very nervous, but they are just more used to it. We don't have it in Europe and last time I was in America I visited one of their stores and they have some great stuff. Next time it will be easier. When I am cycling by myself I use the roads. When I am cycling with my daughter, I use the sidewalk. I always treat pedestrians with respect, and give each of them an " excuse me " and " thank you, have a nice day ! ". My wife says our daughter is controlled by me remotely because when we're riding I'm constantly reminding her what to look out for.
" We're coming up to a corner, remember to look behind you and then to your right for traffic ! " " Don't cross in front of a car until the driver is looking at YOU ! " I'm constantly drilling them into her 9 year old little brain. I want the rules of the road to be drilled into her. I've told her from day one of being on a bike that if you follow the rules of riding, you lower the chance of getting hurt. This blog is getting out. My fellow REI gearhounds love what you wrote. We are going to try to offer this class again several times throught the summer. Be ready, you will get more chances to work on your presentation. Try to stop by next time your in the area so I can introduce you to others in the store. Hey, I almost went to that class! If I had known I could have had a chair to put me feet up, I certainly would have been there! 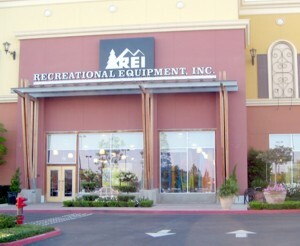 Great store and classes..My hometown REI store. I will be at the next one, since I just started (And outfitted my bike.) to ride to work instead of drive. I do lots of public speaking. It's always hit or miss.